Thank you for visiting the Spears School of Business at Oklahoma State University. Whether you are a prospective student, returning alum or a corporation/business inquiring about one of our outstanding programs or services, we trust that you will find the information you need. Please contact us if you would like additional information. Below is a brief overview of the Spears School. The Spears School of Business is composed of seven academic departments with more than 100 tenure and tenure-track faculty. The student body is made up of nearly 4,500 undergraduate students pursuing nine majors and approximately 780 graduate students pursuing eight master’s degrees and eight PhD concentrations. Spears Business offers undergraduate majors in accounting, economics, entrepreneurship, finance, general business, international business, management, marketing, and management information systems. The school’s MBA is recognized as one of the top values in the United States. Spears Business also offers specialized master’s programs in accounting, business analytics, economics, entrepreneurship, information assurance, management information systems, and quantitative financial economics. In addition to on-campus programs, several undergraduate majors and graduate degree programs are offered online. Spears Business offers doctoral programs in economics and in business administration with concentrations in accounting, entrepreneurship, finance, management, marketing, and management information systems. In addition, Spears offers a Ph.D. program with an executive research option for full-time business leaders. All academic programs in Spears Business are accredited by the AACSB International (exceptions are the master’s and PhD programs in economics, which do not come under our scope of accreditation). The faculty of the Spears School of Business is composed of noted scholars, authors, sought-after consultants and practitioners, and caring teachers. Many of the faculty have received outstanding teaching awards and have been recognized for innovative instruction. The faculty are nationally and internationally recognized for their publications and leadership positions in professional academic associations. The Spears School of Business enjoys the support of thousands of alumni, friends, corporations and foundations. We hope you will consider being a part of our growing number of supporters. Visit us online. Since 1958, all academic programs in the Spears School of Business have been accredited by the AACSB International. This means they meet or exceed established standards for business schools internationally. AACSB International accreditation represents the highest standard of achievement for business schools worldwide. Institutions that earn accreditation confirm their commitment to quality and continuous improvement through a rigorous and comprehensive peer review. AACSB accreditation is the hallmark of excellence in management education. The Spears School of Business actively incorporates technology into the curriculum and seeks input from leaders in business and government to help create industry-driven degrees. Currently, the School is home to a growing number of research centers and institutes. The faculty, with varied academic, governmental, corporate and consulting backgrounds, bring real-world experience to the classroom. In many courses you will receive the necessary theoretical background, but you will also learn about the latest trends and developments from faculty attuned to what is going on in the real world. Real-world applications may be in the form of a lecture, company-based consulting project, a practicum or other means. The Spears Business also encourages students to take advantage of the study-abroad opportunities offered by the Office of International Business programs and numerous internships. Students in the Spears School of Business have the opportunity to apply for a number of different scholarships. Most scholarship recipients are selected by a scholarship committee within the School. Oklahoma State University is a comprehensive university with instructional, research, and outreach missions. 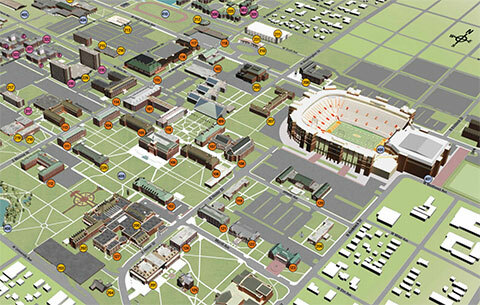 OSU is composed of four campuses and extensive off-campus instructional and assistance programs. The combined enrollment for these locations exceeds 28,000 students. The Stillwater campus has an enrollment of more than 20,000 students and a full-time faculty of more than 900. International students are an important part of the OSU student body; seven percent of undergraduate enrollment and 17 percent of graduate enrollment comes from more than 90 foreign countries.